A Native American woman is bloody, barefoot, and frozen to death in the snowy Wyoming hills outside a reservation. Why was she out there? That is the mystery for a collaboration of local law enforcement, the FBI, and the US Fish and Wildlife Service in Wind River. 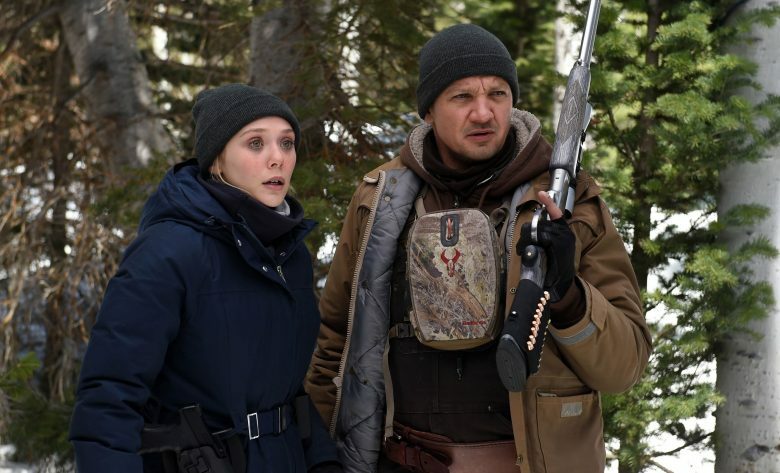 Elizabeth Olsen and Jeremy Renner brave the Wyoming wilderness on the hunt for criminals. Weinstein Co. The first to discover the body is wildlife agent Cory Lambert (Jeremy Renner). He comes out to the reservation for his regular duties of tracking mountain lions that savage cattle, unprepared to find a woman’s corpse in the snow. It’s a tough discovery for Cory, who has a tragic history of trying to get over his own loss. He tries to impart some wisdom to the grieving family about letting guilt run its course in one of his many thoughtful passages. FBI agent Jane Banner (Elizabeth Olsen) is called in to help with the case but comes ill prepared for the rural area in both tactics and attire, embarrassed to borrow warm clothing to investigate the body in the snow. However, she’s compassionate when she discovers the woman was raped multiple times before she froze and that an autopsy report won’t rule her death as homicide. Determined to uncover the true reason for the victim’s death, she teams up with Cory and reservation police officer Ben (Graham Greene) to find the rapists, mostly venturing out on their own in the cold and desolate reservation. When investigating a potential suspect, Jane asks Ben if they should wait for backup. He informs her this isn’t that kind of a community; you’re too far out to call in backup for gun-toting criminals or an ambulance for major injuries. Welcome to Wyoming’s Wild West of the modern age. Wind River plays its story mostly straight as a procedural with small nuggets of charm for the film’s likable characters. Cory is given just enough scenes to convey his rough family situation and how personal this mystery is for him to solve. Renner doesn’t blend seamlessly into the role of a Midwestern cowboy, but he does have a surprisingly natural ease when feeding horses with his son and teaching him how to ride. Olsen plays the most lively and emotional of the cast, but never overstepping her bounds as an FBI agent who feels like a fish out of water; she’s irked by how Cory goes about extracting information cowboy style, but isn’t too fearful to flex her FBI authority in intense situations. Cory and the victim’s father share a tender moment when dealing with death. Weinstein Co.
Graham Greene, whom you might know from Dances with Wolves and The Red Green Show, is perfectly cast as the subtle comic relief of the trio, having been served some of the best lines for the eyes and ears of the reservation. When Jane looks to him for a reaction about the corpse not being grounds for a homicide investigation, he gives a regretful shrug: “Hey, I’m not used to receiving help around here.” He doesn’t need it, either, given how quick he is as a man of the law, even when one suspect blindsides him with pepper spray. Another strong Native American actor in this mystery is the dead girl’s father, Martin, played by Gil Birmingham. Much like when he played a quietly cocky Texas Ranger in Hell or High Water, he embodies the perfect combination of disdain for help and sadness for the loss of his daughter. He even manages to wedge in a few amusing lines here and there. This is the first film to be both written and directed by Taylor Sheridan, who previously wrote Hell or High Water and Sicario. 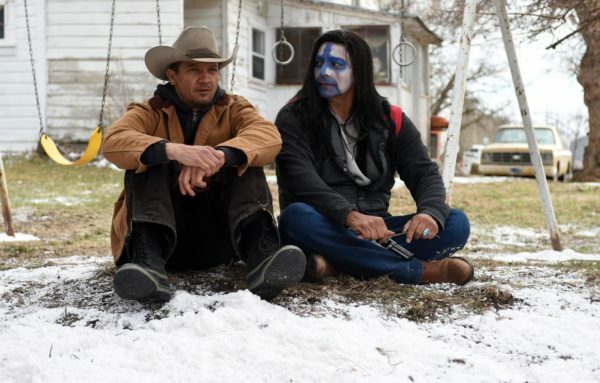 Both of those films had such masterful dialogue that it’s a shame it’s not as present in this picture—the writing in Wind River is not terrible or even that melodramatic, but it doesn’t feel as strong as it should be for the scenes in which Cory talks to his son about death and Ben tries to convey the gritty emptiness of the mountains. Sheridan seems to focus more of his attention on establishing the mood and atmosphere of the rocky Wyoming setting, which he does a stellar job at showcasing, though it feels slightly derivative of Fargo with its snowy void accented by country violins. And as much as I love the music of Nick Cave and the Bad Seeds, some of the songs feel out of place for the more raw moments. It’s hard to appreciate a scene in which a criminal succumbs to the cold when Cave’s lyrics can be heard over the last gasps. Ultimately, Wind River is a solid procedural thriller with its fair share of dark beauty, Midwest charm, social commentary, and blunt western violence. It maintains a certain amount of grit and moodiness that never bores, especially with a strong cast to keep the investigation moving with personality as opposed to just going through the motions of its mystery. While the film doesn’t exactly redefine crime movies as much as Sicario or Hell or High Water may have, it does succeed at being an entertaining drama with a few tricks and surprises up its goose-down sleeves. Mark is a moonlighting movie critic for various websites. A video-store veteran and lover of the medium, he is up for watching just about any movie (yes, including that one).